Obama declared the end of a nearly nine year war in Iraq a “historic moment” on Wednesday, Dec. 14 as he addressed the soldiers at Fort Bragg. 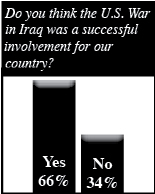 The concluding act by the United States took place Saturday evening when the last of the war troops left Iraq. Accounts of soldiers and pilots, when told their mission was over, reveal that they didn’t fully believe the news. Students at Cedar Falls High School were just as surprised as the soldiers. “I think it is fantastic [that the war is over]. I didn’t actually believe my sister at first when she told me,” junior Shelby Snell said. Senior Maria Dropps is also happy the war is officially over. “It is kind of like a sigh of relief in some way,” Dropps said. For some students, the news was shocking because they hadn’t heard about it for so long. “At first when I found out the Iraqi war officially ended, I realized I forgot it was still going on. Then I was glad to have American troops come back, but I was still slightly concerned about whether or not Iraq’s violence would rise again once all the troops were out,” junior Brianna King said. Some students noticed a lack of awareness. “When I mentioned the Iraqi war ending to some of my friends, they didn’t even know that it had ended,” King said. Dropps thought the announcement that the war had ended was very low key. “Really I only remember seeing it on one or two TV stations. Either people just haven’t really heard about it or some just don’t care, but personally it’s a good feeling to know that we’re not fighting anymore,” she said. All student comments revealed the anticlamactic progression of the war. “In WWII we clearly won the war. Here, there is no victory. Many Americans have died, and we have gained little additional security as a result of their deaths,” Power said. The war was far removed from American society, and Snell thinks that may be why other students are not concerned about it. “I don’t know why people aren’t celebrating. This war seemed as if it was going on forever. Perhaps because it didn’t personally affect us?” Snell asked. But senior John Paul Sevick was personally affected by the war because he knew people serving in Iraq. His uncle, cousin and friends’ parents all served among the soldiers. “Whether we were going over there to remove a dictator who was doing terrible things to his people or for something concerning oil prices, I feel we ended up doing some good over there, so I’m fine with it,” Sevick said. Dropps didn’t know anyone in the war personally, but she remembers doing service projects and buying things to give to families affected by the war. “Seeing how thankful they were when we recognized them is enough to show that they really care about the war ending,” Dropps said.